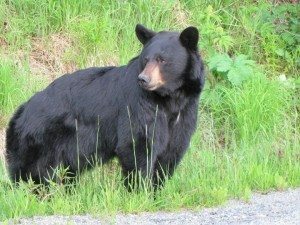 If you’re going to be traveling to (or living in) an area where there are black bears, staying safe becomes more a matter of common sense than anything else. Here are some tips for avoiding your own black bear encounter, from someone who’s been there. Yep, unfortunately, I’ve had my fair share of encounters with black bears! My earliest memory concerning black bears is the story my mother often told of the time when I (at age 5) was chased up a ladder by a bear. She discovered me tapping on a second story window trying to get back into the house. That was back in the day, many years ago, when kids were turned outside in the morning and told to get lost until lunch. 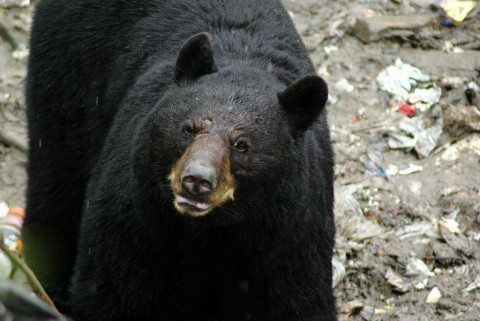 In northern Minnesota where I live, Black Bears are just a part of life. They’re almost as common as the white-tailed deer. If you live in a rural area, having run-ins with these lumbering creatures is most likely a commonplace event. A number of times passersby would pull into our driveway to warn us that there were bears in the east end of our sizable raspberry patch — while we were picking berries in the west end of the patch. Never have I been charged or threatened by a Black Bear. 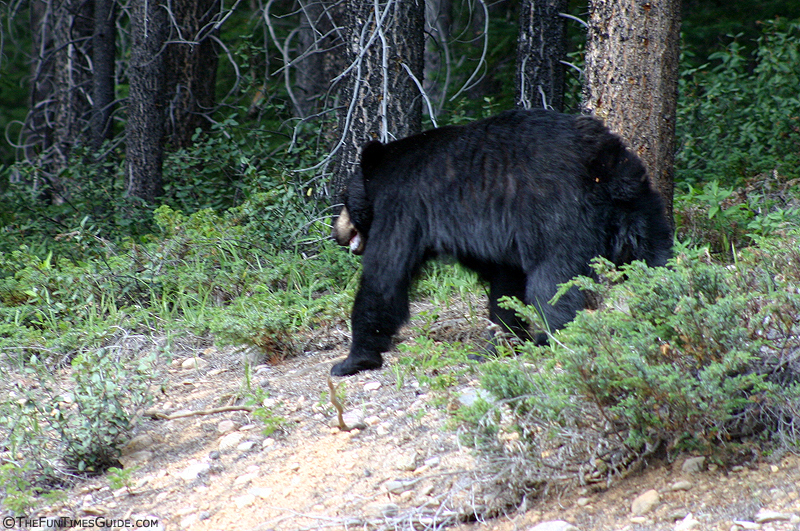 More often, the Black Bear will run as fast away from you, as you are running away from it. Just the same, every year you see news stories of bears being shot out of trees after they’ve wandered into suburban settings and have been forced to deal with humanity. In Duluth, a city of about 85,000, the bears come to town so often that they are looked upon only casually. In fact, they are often ignored and allowed to leave peacefully on their own. The less contact we humans have with the bears, the better for both species. When bears become a problem it’s almost always due to issues that arise when the animal kingdom becomes too reliant on the human domain for food. In the early spring and late fall, when natural foods such as nuts and berries become scarce, the bears come out of the woods and scrounge through discarded food left from humans. Successfully controlling a bear (or bears) that are in your yard is as easy as taking their food supply away. When I purchased a country home 25 miles from the city — in an area of dense woods — I was plagued by bears for the first year. It took that long for them to learn that the buffet had been closed. You see, our home’s previous owner (with 2 small children) routinely had a half dozen overflowing garbage cans in the yard. Bears develop a route, and as part of their routine, they return at regular intervals when they assume there is a fresh supply of food for them. One afternoon, my wife was working in a corner of the yard planting some flowers. Our 7-pound dog Rascal, a Pomeranian/Yorkie mix, was on watch. With her back to the rest of the yard, my wife didn’t see the bear wander in toward our small compost pit — where we disposed of food and yard waste. Rascal took off after that poor bear, hell bent for election. Running around it and darting toward it showing all his teeth and barking like crazy. The bear, in return, headed for the woods and safety from a very protective dog that was defending his turf to the end. My wife just picked up the dog and calmly went inside the house for a while to make sure the bear had left the area before returning to her gardening. One summer I was bicycling on a country highway only to come around a corner and have a bear ambling very slowly across the road in front of me. I stopped probably about 150 feet before reaching the bear, and I just waited. Calling out a number of times to make sure he knew I was there was enough for him to know that he was supposed to leave, and he did so in a non-threatening manner. Since bears can be dangerous when you sneak up on them so to speak, making noise of any kind will help them identify you as a passive threat, and they will usually leave to avoid any confrontation. You Don’t Need A Closer Look! As a young adult, I foolishly went to turn on the car headlights that were pointed toward our trash cans. I was hoping to get a better view of the 3 or 4 bears that were digging for food scraps almost nightly. I had placed my car pointed toward the cans before dark. Then, when the time came, I reached in and hit the switch — only to have one of the bears lunge in my direction. I was at least 100 feet away from the bear, and in a panic I ran for the house. Unfortunately, I was wearing a pair of open-toed sandals at the time, and I carelessly tripped over the plow blade of the tractor that was parked in the driveway — instantly removing the toenail from my big toe. Limping to the house and leaving a trail of blood, I had learned a valuable lesson the hard way. Don’t panic… and don’t mess with bears. They are a wild animal that can be unpredictable! As seen in the last photo above, it’s clear that black bears are incredibly powerful creatures. That bear managed to break tree limbs with her teeth, while standing tall high up in a tree. It was incredible to watch. For the most part, as long as they’re in the trees or retreating away from you, then you’re safe. But, on the rare occasion that you are confronted by a black bear and it begins to attack, heed the following advice. NEVER surprise a bear, so you must always make your presence known — talk loud, sing, clap, be heard. Then back up slowly. If you think you’re about to be attacked, don’t move — just play dead. If it attacks, go after the bear’s eyes or nose. Fight like hell!